Choosing a fly for the beginner fly fisherman can be a daunting task. Most fly fisherman will spend time in a local fly shop and speak to the locals getting specific information on the type of fish and the flies used to catch these fish. As a fly fisherman gets experience they become more familiar with insect matching and behaviour to better select the appropriate fly for the particular section of river, time of year and yes even the time of day. Seeing success on the river will ultimately depend on your knowledge and appropriate matching of the insect hatch. Insect hatches can last from minutes, to hours to days. The more a fly fisherman understands the hatch the better their chances of catching the type of fish their looking to catch. Let's get aquainted to the process first. 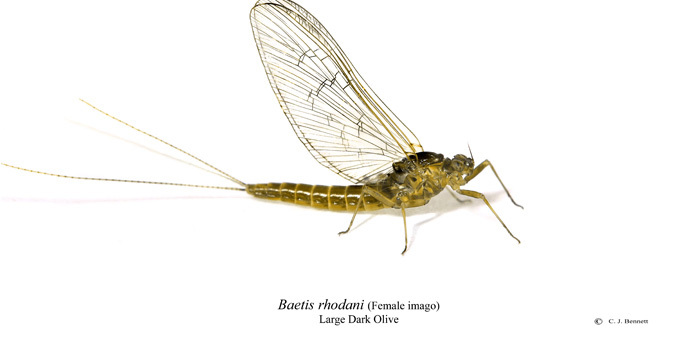 All insects that live in trout streams and rivers will have been identified and given a common and scientific name. Have a look at the two images below. The first is an actual photo of a Green Drake or in scientific terms "Baetis rhodani". The Green Drake is a fantastic insect. It is ever present on many Western and Eastern trout streams. It is large and a trout favorite. Now that we have a starting point, let's summarize the decision process into two easy steps. Without a fly, you don't catch fish. A fly is used to imitate an insect and when used properly will mean the difference between catching fish and going home empty handed. The fly selection is entirely based on what you're trying to catch and having a variety of flies available is critical. 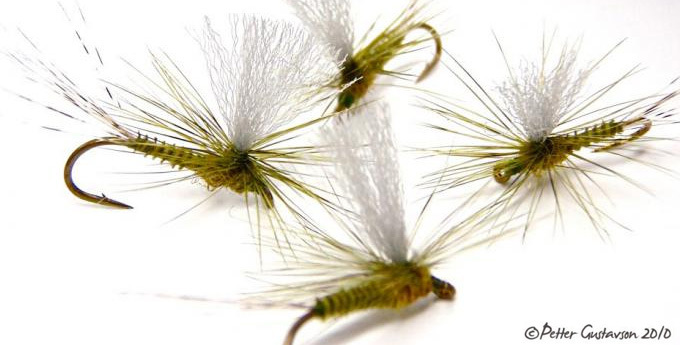 Selecting the correct fly is not difficult after you've had a little practice. In the coming weeks, we'll be providing more information on Fly Fishing Entomology to assist anglers of all kinds to better understand the importance of aquatic insects and fly fishing for Montana trout.